The SYS-1 Motion/Zero Speed Monitoring System accurately tracks speed conditions and system operations on bucket elevators, conveyors and rotating machinery. The SYS-1 system monitors the status of your bulk handling equipment directly from the shaft speed. If an overload condition develops, an alarm sounds. 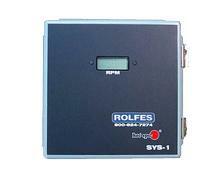 If the shaft speed is further reduced, the SYS-1 can be wired to automatically stop equipment. The automatic alarm setpoint is preset at 90% of the normal operating speed. The equipment stopping point is as 80% of normal operating speed and can be reset with just the press of a button. After the equipment is programmed, the rest is automatic. When the system is started, a preset delay allows the equipment to reach full speed before the automatic system is actuated. How many places can you be at one time? Let the SYS-1 do the watching for you. Overloads occur, belts slip or break, and material can clog and plug. Let the SYS-1 go to work for you. Factory Preset warning at 90% and shutdown at 80% of equipment's full speed.